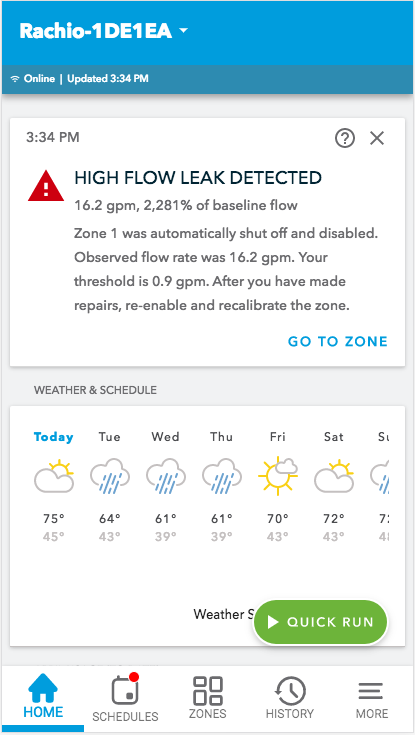 If you have a wired flow meter or Rachio Wireless Flow Meter installed with your Rachio controller, you can receive notifications to alert you of potential problems with your system. Notifications can appear as push notifications, emails, in-app notifications, and events within the History feed. 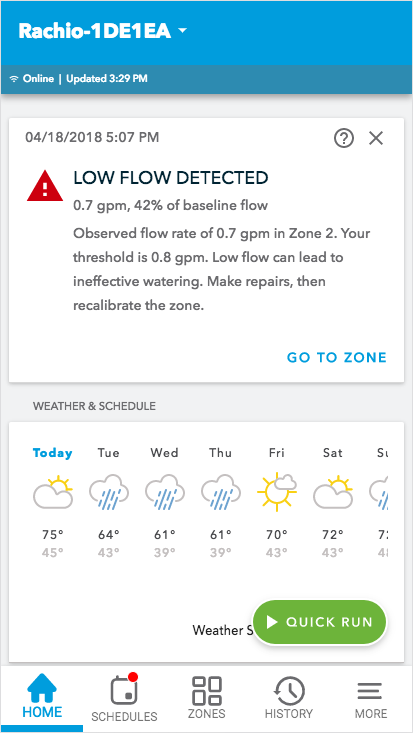 Some notifications are exclusive to Rachio Wireless Flow Meter and will not appear with wired flow meters. See below for details. Why are flow notifications important? Notifications should be relatively rare, but they are essential for alerting you to expensive or damaging issues related to flow rates or leaks. As a user, you cannot turn off flow notifications, as they are an essential piece of the flow monitoring process and crucial in alerting you if something is wrong. If you find that notifications are too frequent, you may adjust your thresholds to decrease your flow meter’s sensitivity. What types of flow notifications may I receive? There are several types of notifications. Some, like a high-flow leak, may require immediate attention. Received a leak notification, or found another issue with your sprinkler system? Click the button below to find a local Rachio Pro! High-flow leak with auto shut-off. This alerts you to a high-flow leak and any zones that have been disabled to protect against the leak. High-flow leak without auto shut-off. This alerts you that a high-flow leak has been detected. If auto-shutoff is disabled, the problem zone will continue to run. Noticing frequent Inactive Flow alerts? Your system could be slower to depressurize after watering, which can lead to false positives. Go here to learn about false positives and how to adjust your Settle Time. Battery low (available only for Rachio Wireless Flow Meter). This informs you of low battery in your Wireless Flow Meter before your battery runs out of power. Flow meter connection lost (available only for Rachio Wireless Flow Meter). This alerts you to any lost connection between your flow meter and the Rachio 3 Smart Sprinkler Controller. Flow meter reconnected (available only for Rachio Wireless Flow Meter). 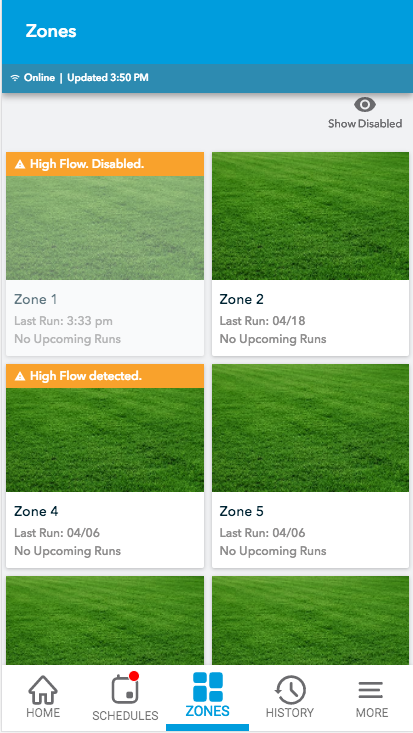 This informs you when your flow meter reconnects to your Rachio 3 Smart Sprinkler Controller.